I purchased my first GPz1100 in February 2008 for $2000. It was up for auction on eBay but I missed getting to a computer in time and the auction ended! 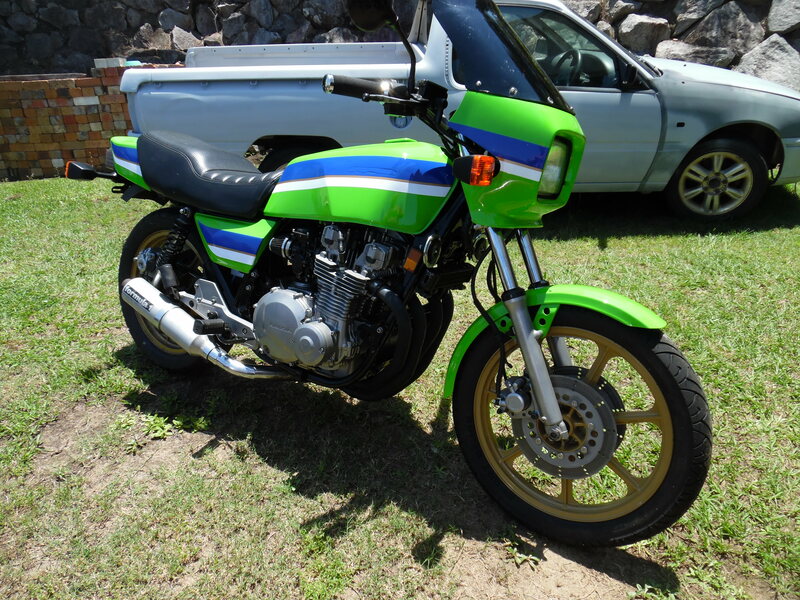 Lucky for me there were no bids as the model was not popular despite it being in my opinion the most reliable Zed ever build prior to the GPz900R. I contacted the seller and he agreed to let me have it, subject to inspection, for the offer price. The owner had it for 16 years but had only ridden it a few times in the last couple of years and due to a lack of maintenance the brakes were seized and the clutch often locked up when the lever was pulled in. The disks were worn but the motor starts first go and purrs as it had just been rebuilt with a 1175 kit (he said) and a bit of extra work. I was not able to confirm the engine enhancements so I was a bit sceptical that the previous owner had $4000 spent on the engine. A few years later when I stripped the engine I was in for a pleasant surprise! 1982 GPz1100B2 prior to dis-assembly and rebuild (see below for rebuilt version).Back in 2011 my then girlfriend dropped the 1100 and bent the rear sub-frame, I rode it for a while but decided it needed some serious maintenance as oil was leaking from a few places. Thinking I could quickly turn the bike around I took it off the road. Seven years later (October 1st 2018) it is now 99.9% complete and I’ve taken it for a test ride round the block (a few times). When the body work comes back from the paint shop it will be ready to register. Then I can take some time to make some subtle modifications towards the “Resto-Mod” end of the spectrum rather that in the factory restore end of the spectrum. Been riding it and loving it, smooth and responsive but a few teething issues at first. Fuel Sensor was rusted and then failed, lucky a Z1R fuel sensor/float unit is the same as the B2, I needed one and after locating one that Doremi make I ordered it and its a perfect replacement. Regulator must have packed it in as the Stator burnt out big time! My zx1100A1 unit has exactly the same Stator and a compatible Regulator. I made a new wiring harness and plugged it in, battery now charging nicely. Fouled plugs keep popping up every now and then, so I am sourcing 4x Iridium BR8EIX plugs and tuning the carbs to suit.